“Children are a heritage from the Lord, offspring a reward from him. Like arrows in the hands of a warrior are children born in one’s youth. Last fall my oldest son, Jeff, and his wife, Jill, announced that their prayers for another baby had been answered— but not just one baby. Four! having some needed surgery but is expected to do well. We all thank God for these newest little ones and for the huge team of doctors, nurses, and staff that assisted in the birth and in their care at the NICU for several weeks. We also appreciate the care the smallest one is getting at Boston Children’s Hospital as he awaits surgery. 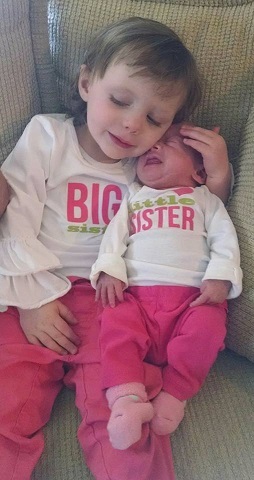 Wrapping one’s head around four premature newborns joining a family with two active children four and under is daunting. Since the family lives over six hundred miles away, my visits to help are limited. Jill’s mother has been a life-saver, traveling there from the mid-west several times to help. I just returned from my second visit to their home. Generous people from their church and my son’s workplace have contributed meals non-stop. They have been blessed to find a wonderful helper/sitter who is equally adept at handling babies, a toddler, and a pre-schooler— and she’s a trained nurse. Other friends have also volunteered to assist. Having children one at a time is life changing. Adding four at once is mind-blowing. The walls of their home are lined with bins of clothes of varying sizes, diapers, wet wipes, bottles. Other accoutrements are car seats for infants and some for children, boppy pillows, sleeping slings, strollers, cribs, high chairs— you get the picture. It’s everything times four. There are also two changing tables and rocking chairs. 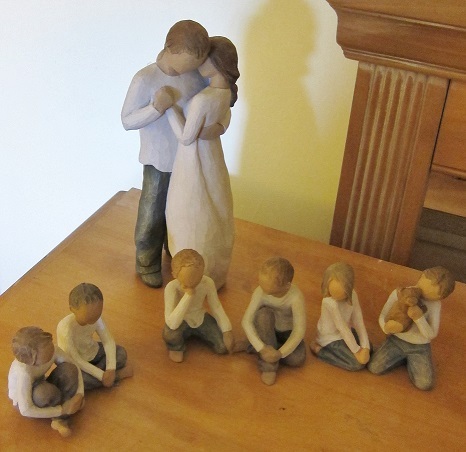 Prayer ~ When she learned that they were expecting quads, Jill began a prayer support group that she kept updated with information as her pregnancy progressed. I did also. This prayer group has been such an encouragement and faithful in storming heaven for the family and especially these new babies. Feedings are challenging ~Jill furnished pumped breast-milk to the hospital while the babies were there and still provides a supply for the little guy. She pumps five times a day. Each evening Jeff and I prepared the 18 bottles needed for three babies every day, each child has different amounts. Jeff, the math whiz, calculates and adds just the right amount of dry formula to create “fortified breast milk” and the totals needed for each baby. My job was to have the 18 bottles and all the four inserts cleaned and ready to go. We color coded the tops for each specific baby to keep it straight. The person feeding records how much each baby takes in at every feeding—also what they put out, but we won’t go there. When the youngest comes home the numbers of bottles go up. I helped with changings and feedings as did Jeff when he was available. Jill, bless her heart, fed all three babies at the 3am feeding with the aid of three boppy pillows. She’s one tired mamma. Transportation ~ The kiddos have 2 double strollers to accommodate their infant car-seats. They also have a quad stroller for when they can sit up. With a four-year old and a two-year old who require car-seats and now four more little ones, it takes more than your average SUV or mini-van to transport everyone. 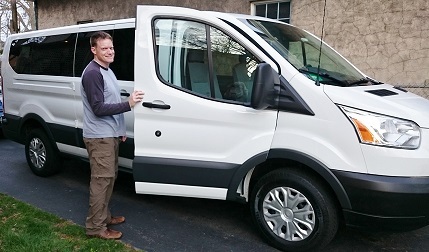 So now they have added a Ford Transit 350 XLT to their driveway. It has room for all six car-seats with space to spare. Outside Help ~ Jeff and Jill were not the first couple to welcome quads. Hence, there are strollers and all sorts of devices designed to assist parents of multiples. 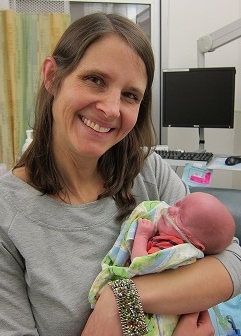 Jill is part of an internet support group of quad moms that share important information like specific health concerns pertaining to preemies and multiples, as well as how to deal with a multitude of other issues. There is even a quad support group for dads. Friends of theirs have not only helped with meals, but with transporting their preschooler, arranging play-dates, and donating clothing and equipment. Siblings ~ The toddler and two-year-old have been so sweet welcoming their little siblings. And remarkably, for young children, they are adjusting very well well having less of their mom and dad’s attention. Watching how Jeff and Jill have and are adjusting to their new life fills me with awe and pride. They are doing a wonderful job in spite of being sleep deprived and overworked. Jeff and Jill’s faith, patience, grace, love for their family, and sense of humor are an asset every day. You two are doing a terrific job. 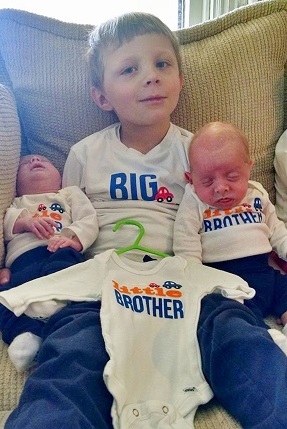 Janet, Thanks for sharing such an uplifting and encouraging story about this sweet family. They have much “on their plate” but seem to be doing it all with the Lord’s help and grace!! Praise Him!!! God Bless all of you!! Thanks, Allison. Jeff and Jill have demonstrated grace under pressure from the beginning of this odyssey. What a wonderful update, Janet!! And what an answer to prayer. 🙂 Thank you for sharing these wonderful photos and thank you for allowing us to watch as the “Littles” grow! It brings back many memories of the triplets. Will continue to pray for continued growth for all of these precious gifts. Congrats to all!! Thank you, Elaine. They are all so precious and already seem to display their own personalities.